This chapter is essentially a declaration acknowledging that only God's assistance has enabled Am Yisrael to survive the hostility and antagonism of the enemy nations. Those nations are described in this Psalm as seeking to "devour us alive," and likened to raging floodwaters. Their hatred is so constant and unrelenting that they seem naturally inclined to oppress us, just as wild beasts instinctively devour their prey and floodwaters flow naturally until they are held at bay. Thus, the Jewish people in their natural state are exposed to fierce enemies who seek to destroy them, and only with God's protection have we managed to escape from the claws of our foes and survive for all these centuries. 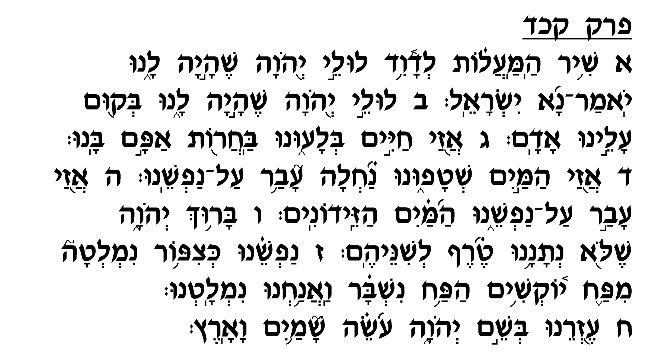 Similarly, verse 7 compares Am Yisrael to a bird caught in a hunter's trap but then flies to safety when the trap inexplicably breaks. Our nation always finds itself in a "trap"; we live constantly under the threat posed by the enemies who devise strategies to plan our demise. As we declare in the Haggadah on Pesah, "In each and every generation they rise against us to destroy us." Yet, in every generation the "trap" breaks in one way or another, and we somehow escape and continue to survive. This chapter of Tehillim thus calls upon the Jews of every historical period to recognize the dangers that lurk all around us, and the extraordinary miracle of our nation's survival that repeats itself in each and every generation.